Ana Nojoom bent alasherah wamotalagah / I Am Nojoom, Age 10 and Divorced. 2014. I Am Nojoom, Age 10 and Divorced is a 2014 Yemeni drama film directed by Khadija al-Salami. It was selected as the Yemeni entry for the Best Foreign Language Film at the 89th Academy Awards, the first time that Yemen had submitted a film for consideration. However, it was not nominated. The film is based on the story of Nujood Ali, who sought divorce from her abusive husband at age 10. A true story about a ten-year-old girl, forced to marry a man twenty years her senior. She tries to free herself from this violent relationship by filing for divorce at a Yemeni court. Khadija Al-Salami is Yemen’s first female filmmaker and belongs to a new generation of Arab women filmmakers whose work is currently screened in EYE. The opening film in EYE’s programme is an adaptation of the international bestseller about 10-year old Nujood, who made international headlines in 2009 when she protested against her arranged marriage. Nujood became the figurehead of the fight against child brides in Yemen. According to figures of the United Nations and the Yemeni government, some 50% of Yemeni girls are married before they are 18, while 15% is married before the age of 15. The girls are taken away from their families with the promise of a moderate dowry and the argument that there will be ‘one mouth less to feed’. Nojoom’s husband, however, forces his young bride to do hard work and rapes her every night – a legitimate and acceptable act in the eyes of the majority, but not for Nojoom. Cast: Adnan Alkhader, Rana Mohammed, Reham Mohammed. 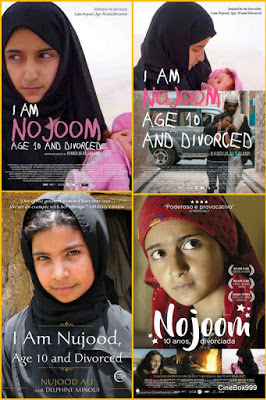 Download Ana Nojoom bent alasherah wamotalagah / I Am Nojoom, Age 10 and Divorced.